North Korean state media has referred to Kim Jong-un as head of the ruling Workers' party central committee, giving him power over one of the country's highest decision-making bodies just over a week after the death of his father, Kim Jong-il. The reference in the North's main Rodong Sinmun newspaper came as a former South Korean first lady and a prominent business leader travelled with two private delegations to North Korea to pay respects to Kim Jong-il as the North prepares for his funeral. In another signal of the shape of North Korea's future hierarchy, state television showed footage of Kim Jong-un's uncle and key patron, Jang Song Thaek, wearing a military uniform with a general's insignia. It is a strong sign he will play a crucial role in ensuring his nephew keeps a grip on power and upholds his father's trademark "military-first" policy. Seoul's unification ministry said it was the first time Jang, usually seen in business suits, had been shown wearing a military uniform on state TV. Jang, a vice chairman of the powerful National Defence Commission, is the husband of Kim Kyong Hui, younger sister of Kim Jong-il and a key Workers' party official. South Korean lawmakers say intelligence officials have predicted that Jang and his wife will play larger roles supporting Kim Jong-un. Rodong Sinmun said North Korean soldiers were upholding a slogan urging them to dedicate their lives "to protect the party's central committee headed by respected comrade Kim Jong-un". The slogan was frequently invoked when rallying support for Kim Jong-il, and its use suggests the heir will likely be appointed as Workers' party general secretary, the ruling party's top job and one of the country's highest positions. North Korea is in official mourning for Kim until after a memorial on Thursday but has begun hailing Kim Jong-un as "supreme leader" of the 1.2 million strong military. Kim Jong-un will be the third-generation Kim to rule the nation of 24 million. On Monday 18 South Koreans crossed the heavily fortified border for a two-day trip that includes a visit to Pyongyang's Kumsusan Memorial Palace where Kim's body is lying in state, according to Seoul's Unification Ministry. 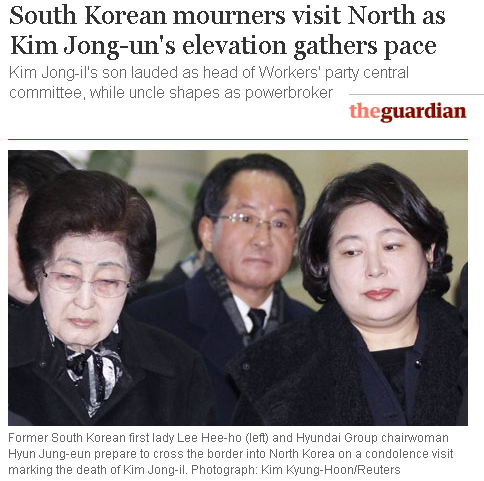 The two groups were led by Lee Hee-ho, the widow of former president Kim Dae-jung, who created the "sunshine" policy of engagement with the North and held a landmark summit with Kim Jong-il in 2000; and the Hyundai Group chairwoman, Hyun Jeong-eun, whose late husband had ties to the North. The North sent delegations to South Korea when the women's husbands died. South Korea has only allowed the two groups to make condolence visits since the death of Kim on 17 December. Pyongyang said obstructing mourning trips to the North would lead to "catastrophic consequences" for relations between the rivals. Even as North Koreans brave frigid weather to visit mourning stations set up at landmarks around the country, the state media are providing details about Kim Jong-un's rise to power. Koreans should become "eternal revolutionary comrades" with Kim Jong-un, "the sun of the 21st century", Rodong Sinmun newspaper said in a commentary carried by the official Korean Central News Agency. The North's state TV repeatedly showed footage of wailing uniformed soldiers, many with shaved heads, and other citizens tearfully professing their longing for Kim Jong-il as they visited mourning sites. The Japanese prime minister, Yoshihiko Noda, wrapped up a trip to Beijing on Monday having sought China's co-operation in promoting stability in North Korea. Noda's first official visit to Beijing since taking power in September would normally have centered on bilateral issues, such as squabbles over islands claimed by both countries, but the death of Kim Jong-il and the elevation of Kim Jong-un shifted the focus. Noda, the first foreign leader to meet with China's leaders since Kim's death, emphasised the need to get stalled six-party talks on North Korea's nuclear weapons programme back on track.